Heroes come in all shapes and sizes, and from all walks of life. You don’t need to wear a cape or have superpowers; becoming a hero can be as simple as walking to support a great cause. Susan G. Komen Orange County’s Race for the Cure is the largest fundraising event of its kind in Southern California. The vital funds raised from this event help support local breast cancer outreach and coordination of mammogram screenings for women in need, as well as treatment and support services to underserved women in the community. Besides the walks/runs, this year’s Race for the Cure features a special parade and tribute ceremony to honor local breast cancer survivors and a wellness expo. New in 2015 is the PLUS Timing Chip option, which allows the more competitive participant to test his/her hero speed on the course. This year’s Race for the Cure theme “There’s a HERO in YOU” spotlights our extraordinary race participants who, year after year, fundraise, donate and raise awareness to support those affected by breast cancer. One exceptional hero is Angelique Fong of Rancho Santa Margarita. Fong, a wife and two-year breast cancer survivor began supporting Race for the Cure in the late 1990s. 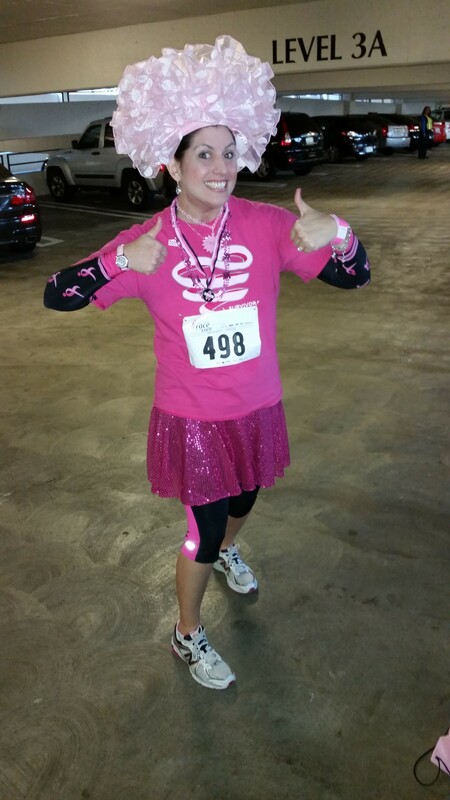 Her journey with Komen Orange County began with her dedication to the Komen mission of saving lives. One of Fong’s favorite Race for the Cure memories was fulfilling her mother’s dream of them crossing the finish line with her brother. Unfortunately, due to a broken pelvis, Fong’s mother was confined to a wheelchair for the race, but insisted on walking across the finish line by herself. “You can see where I get my stubborn nature,” said Fong. Fong would later need that stubborn nature to fight her personal battle with breast cancer, as she learned of her own diagnosis. In 2013, only six weeks into remission, she crossed the Race for the Cure finish line as a first-year breast cancer survivor. With a decade of Races for the Cure under her belt, Fong continues to walk/run for breast cancer survivors like herself, and for their families. Fong is not only an inspiration, but a true HERO. More heroes like Fong are always needed! Unleash your inner hero and participate in our 24th annual Race for the Cure on Sunday, Sept. 27 at Fashion Island in Newport Beach. For more information and to register, please visit http://www.komenoc.org/.